Team up with what is left of the Avengers to fix the damage that Thanos has caused to the universe. 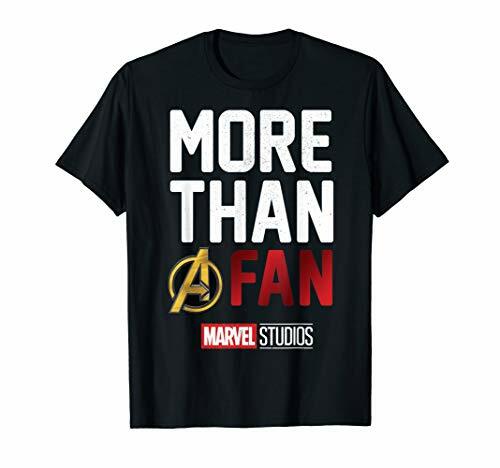 You'll find the perfect gear within this collection of Officially Licensed Avengers: Endgame tee shirts, sweatshirts, and hoodies from Marvel. The Avengers are a Marvel Comics super team of heroes. Led by Captain America, the group also includes Iron Man, The Hulk, Black Widow, Hawkeye, Spider-man, Black Panther, Ant-Man and Thor and more. Their boss is Nick Fury who is director of the peacekeeping organization S.H.I.E.L.D. Together, they literally save the world from alien invaders. Not the best of friends, they come together when danger faces them. With the help of The Guardians of the Galaxy, the Avengers fight to defeat Thanos in the Infinity War. This top features a large A graphic on the front with stitched varsity stripes on the sleeve. This shirt that will be loose fitting. It is designed to be large. It is unisex so it can be worn more true to size by men. It is a short sleeve tee 60% Cotton 40% Polyester.. Your little one will love the colors and comfort of this Avengers Infinity War Boys' Superhero Character Panels with Thanos Short Sleeve Graphic T-Shirt. Made of super soft 100% Cotton fabric, this short sleeve graphic tee tshirt has a cool graphic print on the front of Thanos with the infinity gauntlet and super hero character panels featuring Iron Man, Thor, Vision, Spider-Man, Star-Lord, Gamora, Doctor Strange, Rocket Raccoon, Black Widow, Hulk, Black Panther, and Captain America. This officially licensed Marvel product is great for school or play, and pairs perfectly with jeans, sweatpants, and shorts. Men's Marvel Short Sleeve Graphic Tee. Soft Hand Feel and Great Fit. Your little one will love the colors and comfort of this Avengers Infinity War Boys' Superhero Group Shot with Logo Short Sleeve Graphic T-Shirt. Made of super soft 100% Cotton fabric, this short sleeve graphic tee tshirt has a cool graphic print on the front of a super hero group shot in front of the Avengers logo featuring Captain America, Black Widow, Thor, Black Panther, Rocket Raccoon, Star-Lord, Winter Soldier, Groot, Iron Man, Spider-Man, Gamora, Doctor Strange, Vision, Mantis, Scarlet Witch, and Hulk. This officially licensed Marvel product is great for school or play, and pairs perfectly with jeans, sweatpants, and shorts. Part of the journey is the end so be sure to have the Marvel Avengers: Endgame Classic Logo Men's T-Shirt when you get there! 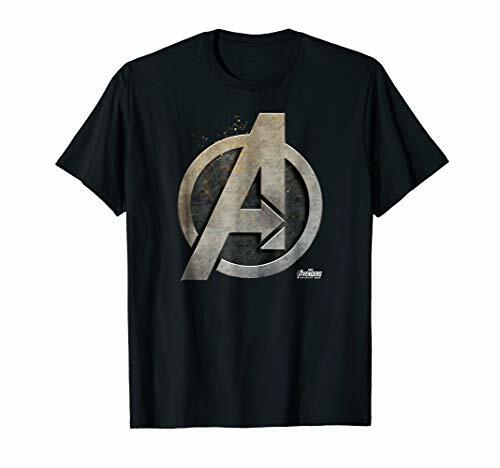 Find out what happened after the Infinity War with an awesome introduction to Avengers: Endgame with the film's logo printed boldly across the front of this Marvel tee. Thread Science tees are printed in the USA and are perfect fun gifts for guys and gals alike! Whether you are a wife looking for great birthday apparel for your husband, a dad trying to find an awesome novelty gag graphic t-shirt present for a son or daughter, or a teenager searching for cool, vintage, retro and classic clothes, Thread Science offers top quality soft touch merchandise that is witty, clever and unique. Each man, woman and teen who wears our short sleeve punny stuff will love Thread Science! Join the adventure with a Marvel Avengers shirt. Shop cool Avengers superhero designs today! 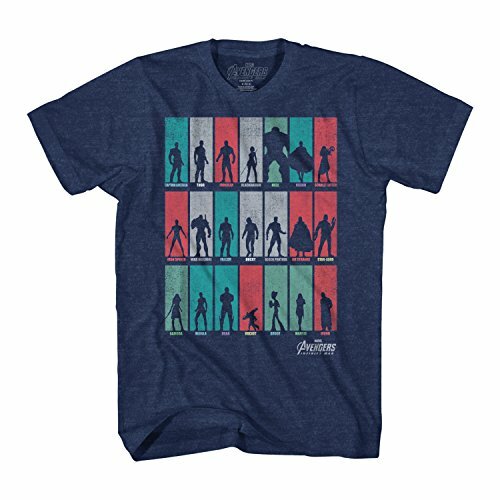 Thanos is up against all the Avengers and the Marvel Avengers: Infinity War Character Collage Men's T-Shirt. All of your favorite heroes like Groot, Black Panther, Hulk, and more are portrayed across a starry night while Thanos looms above on this epic Avengers: Infinity War shirt.